Six thousand years ago, the solar system comprised only two terrestrial planets. A high energy (1041 ergs) impact on Jupiter at that time initiated a 3000 year period of planetary chaos. A plasma cloud many times the size of Jupiter rebounded and rapidly contracted into the flaming proto-Venus. This new planet swept through the inner solar system and ejected what I call priori-Mars, the most ancient of the terrestrial planets, from its interior orbit into one that intersected that of the Earth. Priori-Mars had a solid iron core which was the source of its internal magnetic field and was a living planet with abundant vegetable and animal life, including intelligent life far beyond our own. Priori-Mars (as Yama-Yami in Hindu myth) was described as a 'green man with a red cloak,' indicating that it was covered with vegetation. This, combined with the duality inherent in this name and in the Chinese Yin-Yang figure, were all depictions of the two dichotomous regions of priori-Mars - the still vegetated southern hemisphere and the north polar region, which was covered with volcanos and lava. These correspond today with the southern highlands and the northern plains. Yama was said to have been protected by two vicious dogs, which were obviously its diminutive satellites, Phobos and Diemos. Priori-Mars, Earth and Venus then entered synchronous orbits which resulted in the repeated capture of priori-Mars in a geosynchronous orbit around the Earth for fifteen years followed by its release into a solar orbit for an equal amount of time. This cycle was repeated one hundred times (there were 100 Indras in the Vedas). The collision of the two bodies at the time of each capture may have been prevented by their opposed internal magnetic fields. Priori-Mars always orbited over Mt. Kailas in the Transhimalayas, known in the Vedas as ‘Indra's home on Earth.’ Its release from its geosynchronous orbit was influenced by the tidal force of proto-Venus, when the latter's inferior conjunctions corresponded to its aphelions. At these times the solid core of priori-Mars exited the planet and swooped into a lower orbit around the Earth while the outer shell drifted away. The two recombined eight days after they left the vicinity of the Earth and the planet reformed during the fifteen years that it orbited the Sun. 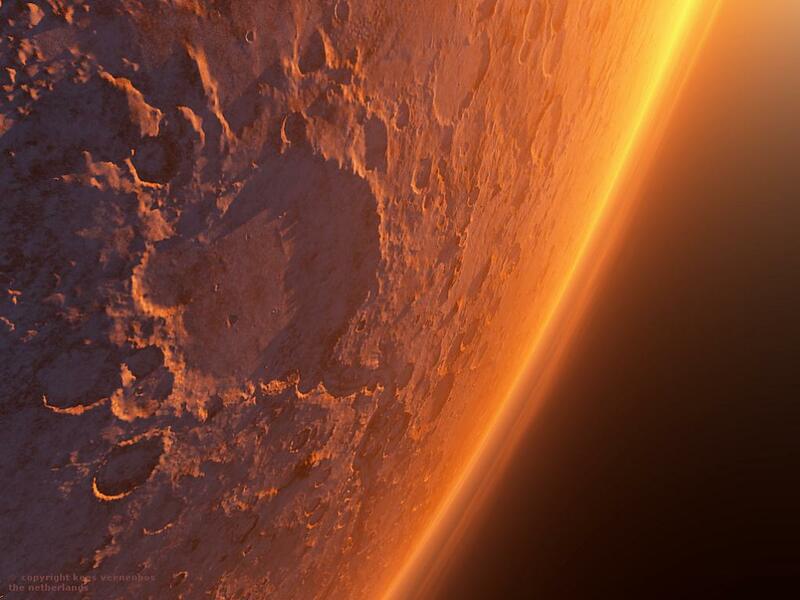 But 2,690 years ago, after the hundredth encounter, the outer shell of priori-Mars failed to recombine with its solid core and slid out to its current orbit, forming the low density planet we now call Mars. Prior to the Earth encounters, ‘innumerable encounters' with the more massive proto-Venus had greatly distorted priori-Mars into an asymmetrical shape described as a ‘dog head’ in a number of cultures. This was the origin of the Egyptian deity Anubis which has a black snoot and a green head. Because it was an ancient semi-rigid planet, a record of this distortion remains, both as a global gravitational anomaly and a set of faults which span the entire planet, centered on the Tharsis Bulge. Similar mass anomalies were not retained on Venus because of its essentially liquid interior. The magnitude of priori-Mars distortion at that time can be implied from its current gravitational asymmetry and the three circular faults on the eastern side of the bulge. A number of cultures imagined the Tharsis features as the face of a deity, e.g. Horus, Siva. 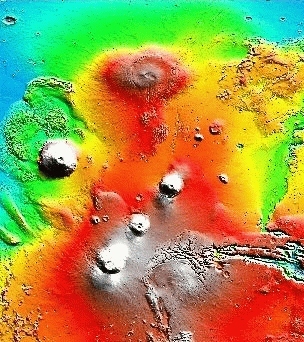 The eyes were the volcanos Arisa and Ascraeus Mons and the beak or ‘magnificent nose’ was just to the east, marked by three concentric circular faults. The bulge was so distended that it was seen as the beak of a great bird in many cultures, e.g. Horus, whose hieroglyph is a bird. The western end of the Valles Marineris cut into the beak (Noctis Labyrinthus) creating an opening interpreted as the mouth. The presence of the largest volcano, Olympus Mons, in the ‘forehead’ of this face led to the practice of placing a spot or ornament on the forehead in the Hindu religion. The Egyptian appellation `Horus the child' is due to the fact that the western end of the Valles Marineris, which cuts into the Tharsis Bulge, looks like a finger on which Horus is sucking. The enormously distended Tharsis Bulge on the equator of priori-Mars caused its north pole to remain facing the Earth throughout each encounter. As it approached Earth, the tidal torque on the bulge forced priori-Mars’ spin axis to oscillate wildly until it pointed toward the Earth. That was the minimum energy configuration of the two planets when orbiting one another. But only the Martian mantle, which contained the mass anomaly, was affected, because its solid core, like that of the Earth today, was isolated from the solid inner core by several thousand km of liquid iron. Thus the capture did not require a change in the total angular momentum of priori-Mars. The continual torqueing of its spin axis maintained the orientation of its north pole toward the Earth throughout each of the fifteen year encounters, but because it was due to tidal attraction on only one point (the Tharsis Bulge), its rotation was a wobbling, precessional motion. Both its initial oscillation and the precessional motion which lasted for the duration of each encounter are described in myths of several cultures. No scientist or scholar in the world has even an inkling of these unique interactions, but they are clearly described in many myths. For example, priori-Mars was seen in myth as a wobbling wheel on one end of an axle with the Earth on the other end. This unique orientation was the reason that the northern plains of Mars today are uniquely asymmetrical. When first captured all the water in the northern hemisphere was drawn toward its north pole by the tidal attraction of the Earth, forming a vast ocean there, now called the ‘Oceanis Borealis.’ This resulted in the flat terrain in the northern plains of Mars. The ill-defined coastlines of this lost ‘ocean’ are due to the fact that the water in it was being blasted into space by innumerable convulsions within priori-Mars and fell to Earth, so the coastlines were not permanent. Earth and Mars quakes were continuous during the dance encounters and the melting of subsurface rocks took place on both bodies. The tidal force of the more massive Earth had a much greater effect on priori-Mars. In a few months the melted subsurface rock was gradually drawn up into the Oceanus Borealis, forming the mundane egg (Hindu myth) within the water, which continued to grow. The lava then extended above the waters taking on many forms, called the Avatars of Vishnu, e.g. the turtle, the boar. Eventually it shot high into the 'air' through a multitude of vents, forming an enormous lava fountain. As it rose higher and higher, the outer parts of the rising lava streams hardened forming vertical lava tubes, allowing the fountain to grow to great heights. This structure reached as high as 1000 km, because it was partially supported by the tidal force of the earth. The figure at right, a bas relief of Achenaten worshiping Aten clearly shows its scale relative to the planet. 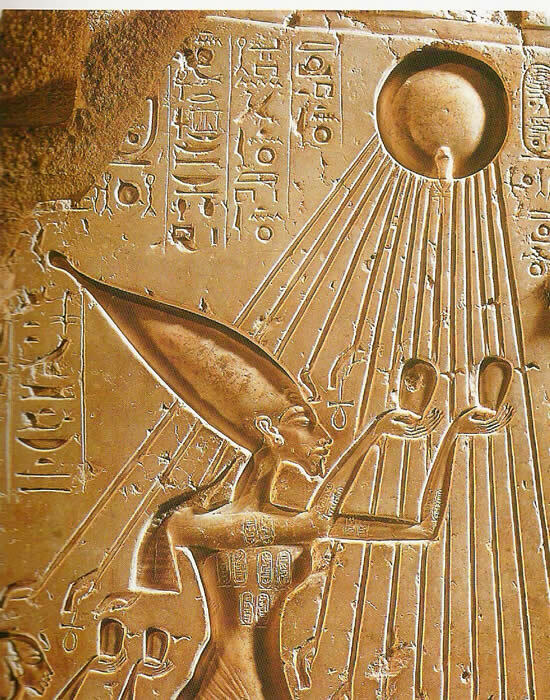 In spite of the many similar Egyptian bas-reliefs, Egyptologists believe than he is worshipping the Sun. It glowed with various colors of red with the brightest at the top, out of which flames shot. This was the major deity in most eastern cultures - Prajapati (Vedic), Brahma (Hindu), Osiris (Egyptian), Atlas and Zeus (Greek), but we can thank the Jewish people for the most descriptive name – ‘the column of smoke and fire.’ Its deification was not only due to its size but to the smoke and flames that shot from the top and serpent-like tornados that danced around it. This was also the axis mundi, the axis on which the two planets, Earth and priori-Mars, were seen rotating like wheels. Extending downward toward the Earth, the Greeks imagined this monstrous glowing feature to be the deity that prevented priori-Mars from falling. Thus the `world' that Atlas supported was not ours. The continent which rose through the waters where Atlas formed, was Atlantis, daughter of Atlas. The seven largest volcanos in the northern hemisphere were the Pleiades, the daughters of Zeus. 4. Since a fall (pata) at this time often causes the destruction of mortals, it is known as vyatipata , or by a difference of title, vaidhrti. 5. Being black, of frightful shape, bloody-eyed, big-bellied, the source of misfortune to all, it is produced again and again. Innumerable bodies, as large as twenty kilometers in diameter, escaped because their velocity was boosted by the combined tidal force of the Earth, the rotational velocity of priori-Mars and its revolution around the Earth. Some of these bodies may also have made a `bootstrap' pass around the Earth. The first bodies in the rapid-fire sequences were from near the surface, and as a result contained significant water within aquifers. In the Vedas, they were described as asura, (having breaths in Sanskrit). One such body was recently photographed from close up by Deep Space 1. Scientists were surprised that what they currently believe are large balls of ice, was actually a Mt. Everest sized rock body, from which a few small vents were spewing out the gases that formed the comet tail. These were followed immediately by hotter glowing bodies (suras, glowing = gods) from deeper in the planet. The resulting streams of bodies and `storms' of millions of small rocks and dust were carried with them and went into various orbits. Those orbiting the Sun are now known as Near Earth Asteroids (NEAs) and short period comets. Astrophysicists recognize that NEAs, comets and meteorites are often members of the same family, due to their very similar orbits, but do not understand why. This streaming process also resulted in the `pairing' of a significant portion of the asteroids observed, a fact which also surprises scientists, because they have no idea of their origins. Both the streaming and pairing of bodies ejected from prior-Mars are explicitly described in the Vedas because the people saw them being ejected from priori-Mars. The streams (ambhamsi in Sanskrit) are also the source of the meteor showers, the presence of which implies they originated close to the Earth. Their dates throughout the year mark the place in the Earth’s orbit near which each convulsion of priori-Mars took place. The total mass of bodies ejected into space over a period of some 3,000 years, is indicated by the 7 km lower elevation in the northern plains. That massive amount of rock now comprises the NEAs, the short period comets, the lunar regolith, the outer covering (also regolith) of Mercury, and the meteorites, many of which are unrecognized, and those yet to fall. The strongest convulsions shattered the fragile lava fountain form, which collapsed on the surface in innumerable pieces, forming the layers of 10-20 cm sharp angled, vesicle covered volcanic rocks that surround both of the Viking lander sites. But the lava feature was soon rebuilt once the convulsions ceased. The other surface component, which superficially resembles soil, is composed primarily of tiny spherical, iron-rich particles which hardened when lava was shot high into the air from millions of vents. These same particles, called chondrules, are found on the most common type of meteorite, the carbonaceous chondrites, which were ejected from priori-Mars during this period. If the NASA landers, Spirit and Opportunity, can examine the soil microscopically, they will find this is the case. Because they came from many depths within priori-Mars there is a wide variety of meteorite types. There are surface rocks containing water (carbonaceous) and others coated with chondrules (carbonaceous chondrites), mantle rocks (stoney), core-mantle interface rocks (stoney-irons) and the nickel-iron meteorites are samples of its liquid iron core. The large numbers of nickel-iron meteorites indicate the degree to which priori-Mars was turned inside-out by the repeated tidal convulsions during the many protracted encounters. The carbonaceous chondrites resulted from surface rocks which were covered with tiny droplets of raw lava shooting from surface vents. Thus all meteorites are from a single tortured, differentiated body, priori-Mars and all were launched into space less than 6,000 years ago. Due to the thousands of convulsions of the interior of priori-Mars, the ratios of oxygen and argon isotopes changed during the Vedic period. That is why the ratios in some meteorites are not the same as in the two dozen plus so-called Martian meteorites, which have isotope ratios similar to those sampled by the Viking landers. Where Did the Martian Water Go? During every convulsion, some atmospheric gases and water were blasted into space and drawn across the 33,000 km gap to the Earth, primarily in Tibet. The vast Tibetan basins were filled until they broke their containment and catastrophically cascaded through the Himalayas forming the four great river valleys, Ganges, Brahmaputra, Sutlej, and Indus which all originate within 20 km of Mt. Kailas, known in the Vedas as `Indra's home on Earth,' and in Hindu myth as Siva's home. Manasarovar and Rakastal lakes, just south of Kailas are all that remains of those great heavenly reservoirs. Scientists today study the massive flow features on Mars and wonder where the water went. Almost the total complement of atmospheric oxygen, nitrogen, and water passed from priori-Mars to the Earth during the 3,000 year Vedic period. This added hundreds of meters to the sea level on Earth since 4,000 BC. The mass of water may even be greater than implied by this figure, depending on the degree to which the seabed may have been compressed by the added water pressure. The periodic 15 year encounters with priori-Mars facilitated the extraction of the maximum amount of water from that planet, since the relatively inaccessible water remaining in the southern hemisphere after each encounter became evenly distributed during the 15 years it was in a solar orbit. The large flow features on Mars, toward the north pole in the northern hemisphere and the lesser flows toward the south pole in the southern hemisphere, are exactly what would be expected as a result of the tidal force of the Earth oriented over its north pole. The probability is high that the Tibetan basins could very well contain fossils of Martian life, in fact some may have already been discovered, but are not recognized as extraterrestrial. A number of unique fossils have been located nearby in Hunan province in Southwestern China. The convulsions drained the red planet of its precious life-supporting volatiles, and as a result, the size of the Oceanus Borealis, the tidal sea that gathered around its north pole, continually decreased in size. Between encounters, most of the tidal ocean evaporated and was redistributed around the planet, until priori-Mars approached the Earth again, at which time the entire cycle of water loss was repeated. This is why there are no well defined coastlines surrounding the Oceanus Borealis. With the exception of manna, the greatest benefits afforded to the Earth were unknown to the ancient peoples because they took place over three millennia. In addition to the value of manna as a food, the Persians astutely stated in their ancient texts (The Avesta) that the seeds of tens of thousands of plants were brought to the Earth in this heavenly food. If the ancients were unaware of the slow acquisition of water and atmosphere, how could modern man ever divine this fact? There are a number of clues. The tree-ring correction curve for radiocarbon dating changes continuously during the Vedic period, implying a global change in our atmosphere during that period. Geophysicists recognize a recent sea-level rise of some 150 meters, but incorrectly attribute it to the melting of glaciers at the end of the ‘ice age.’ The massive fluvial features flowing toward the north pole of Mars and the poorly defined Oceanis Borealis, combined with the almost complete absence of atmosphere and water on that planet, further corroborate the beneficial nature of the recent planetary chaos revealed herein. The great mystery of where the Martian water went is solved. It is part of every plant, animal, lake and ironically every planetary scientist on Earth. A large portion of the rock and dust ejected from priori-Mars arced outward and landed on the Moon in great 'storms', covering only the near side with several kilometers of regolith, for which scientists have no explanation. This recent deposition created the 2 km offset of its center of gravity from the geometric center observed today. As a result, the `Moon rocks' returned to Earth are mostly from Mars and are not native to the Moon, and the most ancient ages calculated for these rocks are those of priori-Mars, not the Moon. Late in the 3,000 year Vedic period, a rapid fire sequence of large hot bodies was ejected from priori-Mars into an orbit which just reached the Moon. As a result, they approached the Moon with less than escape velocity. Their impacts were cushioned by the deep soft regolith already in place. Because of their high temperatures, they were already softened. The additional heat released upon their impact melted them completely and they remained in the basins created by their impacts - a one-in-a-million chance. They formed the maria before the very eyes of an awed generation of human beings. To this day Egyptians celebrate 'the day Osiris entered into the Moon.' This is told in a beautiful Egyptian myth in which Osiris' body was cut into 14 pieces and spread all around by his enemy Set. This corresponded to a collapse of the great lava fountain (Osiris) at the time of the ejection of the bodies discussed above. Isis, the Moon, then went around and collected the parts of her lover's body, and at each location, constructed a monument. The maria are these monuments. Who, even in modern terms, could imagine a more graphic description of the events. The calculated ages of the maria rocks are younger than the surrounding regolith, which give the true age of Mars (~4.7 billion years,) because the extra heating they experienced caused some of the gaseous decay products (Argon) used to determine their ages, to escape. The differences in their calculated ages is also due to the differences in their initial temperature, since they all came from deeper and deeper in the same vent. Thus, there is no volcanism on the Moon and the true age of the Moon will only be correctly determined when bedrock from the far side is analyzed. As each dance encounter progressed, priori-Mars became more and more turned inside-out by the convulsions, to the degree that the liquid iron core was eventually drawn out into space, forming bizarre shapes determined by the microgravity between the two planets. But the devastation went further, reaching its culmination just before priori-Mars was released from geosynchronous orbit. Its glowing solid core appeared in the opening now marked by the Valles Marineris. This was the `eye of Horus' or the `eye of Ra.' The shape of the physical feature exactly matches the hieroglyph, as can easily be seen in the figures above. In fact, the orientation of the physical feature must be inverted to agree with the hieroglyph, proving that its north pole was oriented toward the Earth. In the final stage of each encounter, the solid core of priori-Mars, which was the source of its magnetic field, completely exited its mantle, dropped into a lower faster orbit, moving to the east and revolved independently around the Earth for one or two orbits. At the same time the outer shell began to drift slowly away from the Earth and in the process moved westward relative to its fixed formerly fixed position. This detachment was facilitated by the close approach of Venus, whose inferior conjunction and aphelion coincided at that time and the conjunction of the Sun and Moon at the vernal equinox. The faster orbit of the glowing core gave the impression of great speed. It was called Hermes by the Greeks and Mercury by the Romans. The ancients saw it as an emissary of the priori-Mars deity Zeus (Greek), who delivered his edicts to Earth. In Homer's Odyssey, "he moved with the speed of the wind" implied that it dipped dangerously low over Egypt because in their myth Hathor was said to have been sent to devastate mankind. Scientists today attribute the myth of the speed Mercury to the fact that it orbits the Sun faster than any of the other planets. That motion would never have been described as `moving with the speed of the wind,' just as Mars in its current orbit would never have been described as `the god of war' or `the stormer of walls.' After one or two revolutions of the Earth, the solid core caught up to its shell and the two drifted away from the Earth `piggy-back,' re-entered the shell of priori-Mars once it was outside of the influence of the Earth and `healed' for fifteen years, becoming nearly spherical once again. However, at the end of the hundredth encounter, the solid core was deflected, probably by the Moon, (whose period changed from 36 to 28 days at that date, 687 BC) so that it did not rejoin its mantle. 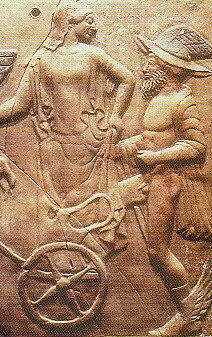 The solid core of priori-Mars then interacted with Venus, for several centuries, as indicated by the clay relief from the sanctuary of Persephone in Locri, in southern Italy, which was crafted in the middle of the fifth century BC, showing the pair consorting. Their interaction finally resulted in the circularizing of Venus' orbit, because its interior is completely molten and the current eccentric inner orbit of Mercury. This scenario is consistent with the findings of mathematical models of the solar system, in which planetary scientists have recognized a `resonance' between Venus and Mercury. In the subsequent 2,690 years rocks and clouds of dust, blasted into solar orbits throughout the Vedic period, have landed on Mercury as regolith. That is why Mercury superficially resembles the Moon, while at the same time having a much higher average density. The dipole magnetic field of the solid iron 'planet' Mercury was the source of priori-Mars' magnetic field, which is still `recorded' in its surface rocks. Due to the reduced pressure, formerly provided by the outer shell of Mars, the superconductive region has retreated deep into Mercury, thereby weakening its dipole field. As the solid core moved into the inner solar system and in order that energy and angular momentum be conserved, the shell of priori-Mars drifted outward and contracted into the smallish, low density `planet' which we call Mars. Its low density is due to the loss of its solid core and some of the liquid iron from the outer core. This scenario is consistent with recent studies of the trajectory of the Mars Global Survey probe revealing tidal effects that imply only a liquid core. The most common meteorites, the carbonaceous chondrites, were formed due to lava fountains on the surface of priori-Mars spraying molten nickel-iron from the interior into the air, where the droplets suddenly cooled and became attached to surface rocks, which were subsequently blasted into space. Billions of tons of this material, has fallen and is still falling into the Sun, or more correctly, into the solar atmosphere, where its atoms linger. Scientists measuring the absorption spectra of the solar atmosphere assume that it reflects the concentration of elements in the Sun. The marked similarity of the spectra to the makeup of the carbonaceous chondrite meteorites measured in the laboratory, has lead scientists to believe that these bodies formed in the solar nebula and are therefore primordial. I claim that the two match simply because so much chondritic material from priori-Mars has fallen into the Sun's atmosphere in the last few millennia. Based on the same solar spectra, astronomers also conclude that the Sun has a much higher carbon content than any other similar stars, but this is just temporary carbon from the meteoroid material in the solar atmosphere. This is just the 'trickster' at work. A thousand trips to Mars and Mercury will not reveal the truth already available in the ancient myths. My books, Firmament, Chaos and Peleh: Hidden Knowledge contain the wisdom of one hundred generations who witnessed the ancient chaos that formed the solar system we see today. The books are available for purchase at www.bbotw.com.